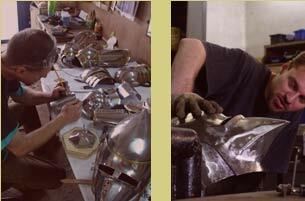 I have been involved in medieval reenactment for a long time. It helped me to get to know the styles of equipment existing in various epochs. During this time I examined techniques of transforming steel, colour metals and leather. It helped me to meet individual needs. I work creatively. Not only do I make exact copies but also modify them a bit before finishing. Stylization is being done according to rigid canon of chosen epoch. General look and technical solutions are important for me. All aspects of work should match historic standards. One must realize that technical problems were solved by numerous methods at armorers' centres in the past times. While recreating in accordance to original patterns I pay atteention to its designation - war, tournament, parade or decoration. 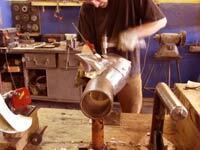 No matter whether I make a simple or detailed element, it is carefully finished. The quality of craft is measured by precision of making. Icreate every piece by hand on individual order, so the items get an individual character. 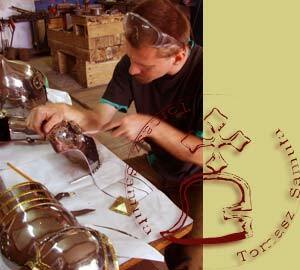 Photos presented on the homepage document my craft and capabilities. At present, suit of armour surely lost its original basic function of being life protection. It gained new meaning, though. Romantic symbolica became its new feature and unique handmade item for collectioners.